Bahr, K.D., Jokiel, P.L. and Rodgers, K.S. 2017. Seasonal and annual calcification rates of the Hawaiian reef coral, Montipora capitate, under present and future climate change scenarios. ICES Journal of Marine Science 74: 1083-1091. Many are the studies that seek to understand the response of marine life to possible future conditions of ocean acidification and warming. The latest such study to catch our attention comes from Bahr et al. (2017), but not quite in the manner that one might think; it is what this study did not find that was of interest to us. Working with specimens of Montipora capitata, Bahr et al. investigated the "direct and interactive effects of temperature, irradiance, and pCO2" on the growth of this important Hawaiian reef building coral. Their work was accomplished at the Hawaii Institute of Marine Biology, University of Hawaii, in a mesocosm system that represented present and projected conditions of climate change, including 12 experimental regimes consisting of two temperature levels (ambient and +2°C), three irradiance conditions (ambient, 50% reduction and 90% reduction) and two pCO2 values (ambient and twice ambient). Over a period of approximately two years, several replicates of the various treatment conditions were conducted in which the authors measured net coral calcification and through statistical analysis were able to untangle its relationship between these three factors. 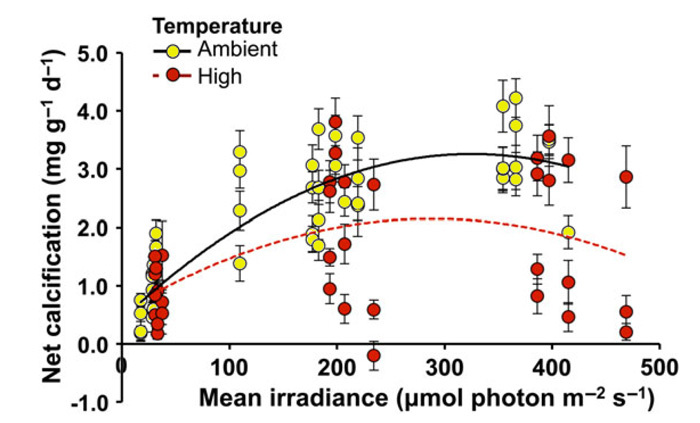 Results of the analysis revealed that temperature and irradiance were the primary factors driving net calcification of M. capitata (see the curvilinear response shown in Figure 1 below) and that "the effect of pCO2 acting alone and/or with other predictors did not contribute to the multiple regression model." Given such findings, Bahr et al. write that "ocean warming in shallow water environments with high irradiance poses a more immediate threat to coral growth than acidification for this dominant coral species." In all actuality, however, it would appear that ocean acidification poses no threat to M. capitata since its influence carried no predictive power in their regression model of factors influencing net calcification. Thus, we find yet another study that does not support the ocean acidification scare stories of corals wasting away in the future because of rising atmospheric CO2. Figure 1. Net calcification of M. capitata vs. mean irradiance at optimal ambient temperatures (23-27°C, yellow circle) and suboptimal high temperatures (27-31°C, red circles) under ambient pCO2 regimes. Adapted from Bahr et al. (2017).